The title of Eta Carinae – Deep Joy refers to the main star in the Carina Nebula, Eta Carinae itself, which appears to our eyes to be near the Trumpler Cluster, a bright stellar nursery. It also refers to the joyful 6/8 time signature, simplicity, and major keys in Sonata K513. I have looked at NASA images of space for hours, perhaps because the unusual color combinations in the finished images are more like my experience of music than the everyday palettes of green grass, blue skies, and a yellow sun. When colors are not stimulated by eyesight, they can be unlike any found in nature. For me, those unusual colors have meaning and connection just like the everyday world has meaning as we move around and our vision satisfies our expectations of the world. 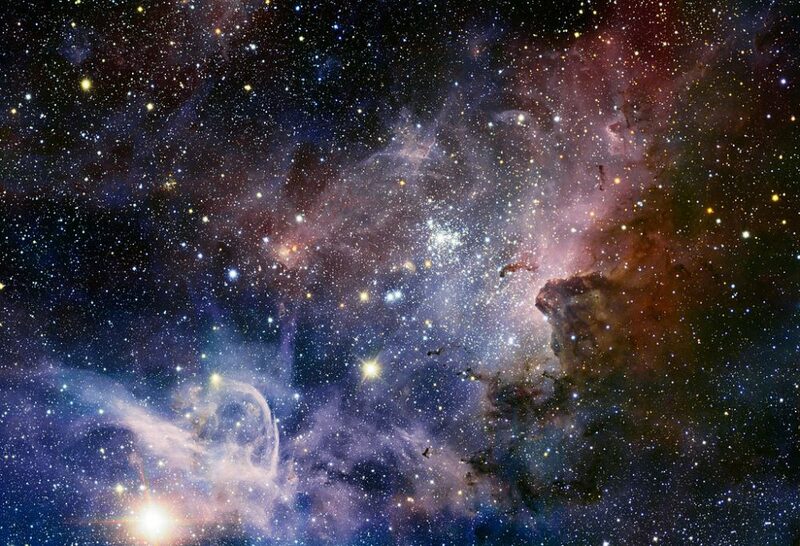 Here, in Eta Carinae, I have connected the joy of the work with this brilliant and compelling image of the Carina Nebula from NASA. Look for text in the painting with the names of the stars in the nebula.